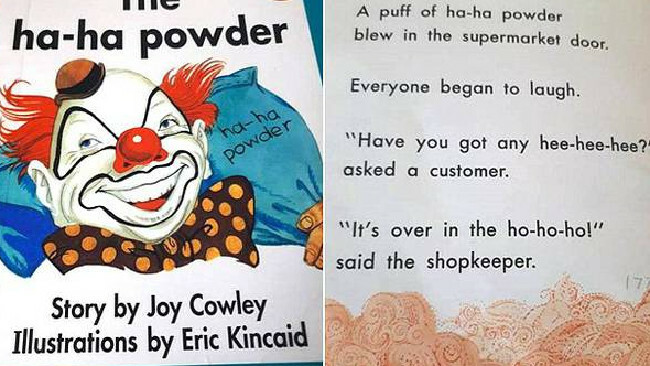 PARENTS have been left divided over a children's book about laughing powder with some labelling the story inappropriate. Mums and dads raised concerns about the story which features a clown who spills a bag of "ha-ha powder" into a town. In a post on social media, a concerned person explained their friend's six-year-old grandchild was sent home with the book. "So my work mate's 6-year-old grandson came home from school with this book for home work..... ummm laughing powder?" he wrote. One page in the book reads: "A puff of ha-ha powder blew in the supermarket door. Everyone began to laugh. 'Have you got any hee-hee-hee?' asked a customer. 'It's over in the ho-ho-ho' said the shopkeeper." In another passage, it says: "The ha-ha powder came to the school. 'Excuse me,' said the teacher. 'I can feel a giggle coming on'. 'So can we!' replied the children. In a second, they were all laughing. 'Take out your books', said the teacher. 'We'll write funny stories'. 'Ha-ha-ha!'" Parents responded to the homework, with one saying "Da f***ing hell is this ... needs to be banned." Another said, "That is a bit out there ..."
However, some parents defended the book and its content written by New Zealander Joy Cowley, now aged 81, and published in 1987. Others said they believe the book to be completely innocent, explaining it has been taken out of context for the era in which it was written in. 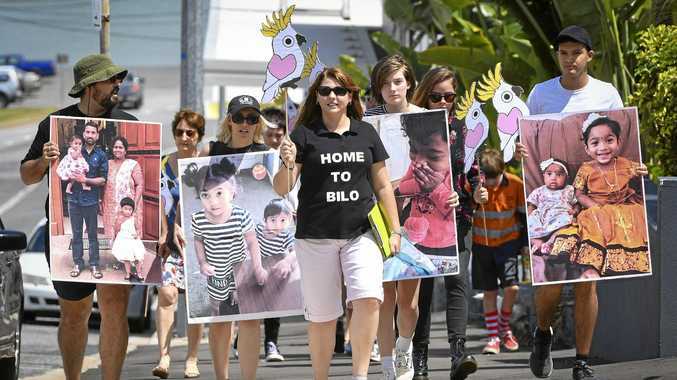 "It would have been written long before P was such a problem ..." one parent wrote. Another said: "I don't think Joy Cowley has a deviant bone in her body. "What was overlooked as innocent isn't anymore call it retro shamin [sic] and what was nothing is something now in this murky world." The popular author has since broken her silence following complaints about the book's appropriateness. Cowley told Daily Mail Australia that the book, published 31 years ago, was written in much simpler times before the problem of drugs spiralled to its new heights. She explains that the book was received innocently at the time, but understands its more sinister interpretation now. "It was the days before drug problems, it was about a clown, who is going to a party, and he drops the bag of powder to make people laugh," the author said. "This is a 1980s book we are talking about, it was a completely innocent time. "Language has changed, now there is a different reality about powders." In the same social media post, another concerned adult told their story of how a young boy from New Zealand was sent home from school with a Where's bin Laden? book. 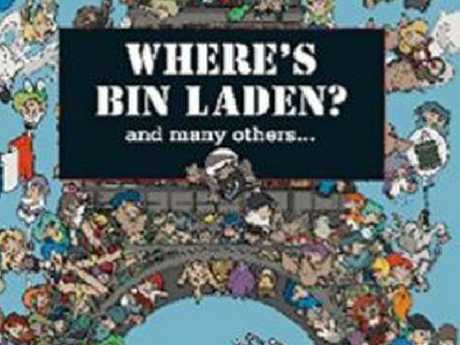 One parent claims their child was sent home from school with a Where's bin Laden book. "Do you remember **** coming home from school with this? In London you have to find the cocaine dealer ... I took it back to school the very next day." One Facebook commenter said they believe adults offended by Cowley's book are being "politically correct" and "overprotecting and over sensitising" our children.